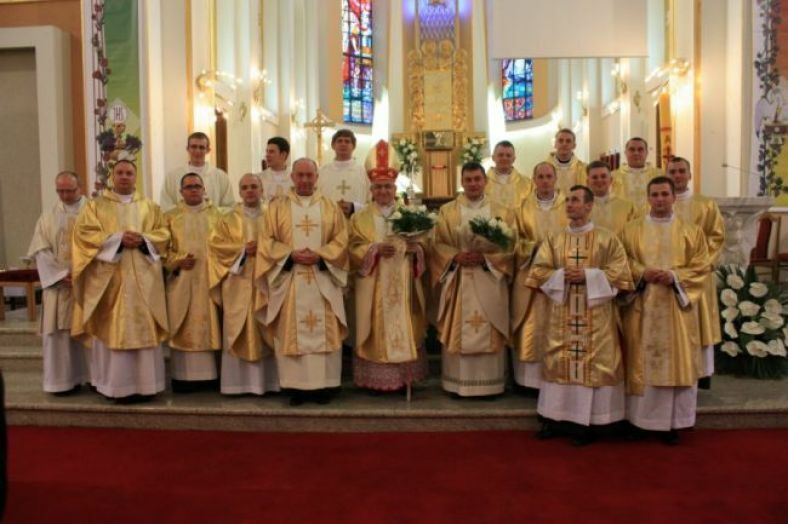 On May 26th 2012 took place in Trzebinia, at the Sanctuary of Our Lady of Fatima, 8 Salvatorians were ordained to the Priesthood and 7 Salvatorians were ordained to the Temporary Deaconate. The ordinations were conferred by the Most Rev. Celstino Migliore, Apostolic Nuncio in Poland. The following Salvatorians were ordained to the Priesthood: Robert Gawłowski, Michał Gołębiowski, Łukasz Karasiński, Szymon Kula, Przemysław Marszałek, Włodzimierz Szydłowski, Robert Ufland and Paweł Wróbel. The following Salvatorians were ordained to the Temporary Deaconate: Wojciech Czarnota, Dariusz Jasuba, Tomasz Koza, Kamil Leszczyński, Paweł Radziejewski, Jakub Trzópek and Hubert Vogel. In the celebrations participated families and friends of the newly ordained, as well as pastors of their home parishes and great number of members of the Salvatorian Family with Fr. Piotr Filas, provincial superior and his Council.